In this artist's conception, a captured alien planet drifts at the outer edge of a distant star system, so far from its sun-like host that the star's disk is barely resolvable at upper right. New research shows that one in 20 stars in our galaxy might have captured a free-floating planet. Billions of stars in our Milky Way galaxy have captured rogue alien planets that once cruised freely through interstellar space, a new study suggests. Many wandering alien worlds, which were ejected from the solar systems in which they formed, likely find new homes with different suns, according to the study. The finding could explain why some alien planets orbit extremely far from their stars, researchers said. "Stars trade planets just like baseball teams trade players," study lead author Hagai Perets, of the Harvard-Smithsonian Center for Astrophysics, said in a statement. They studied young star clusters because capture is more likely when stars and rogue planets are crowded together. Over time, close interactions between stars cause clusters to disperse, so any planet-star encounters have to happen early in the cluster's history, researchers said. Rogue planets are a natural consequence of star formation. Newborn solar systems often contain multiple planets. One or more of these worlds can be ejected as a result of planet-planet interactions, becoming interstellar travelers. Scientists think such roamers are common throughout our Milky Way galaxy. One study last year, for example, estimated that rogues outnumber "normal" alien planets with obvious parent stars by at least 50 percent, and that they're nearly twice as common as main-sequence stars like our sun. Rogues don't have to stay parentless forever, however. They can latch onto a different host star if it's traveling in the same direction at about the same speed, researchers said. Captured planets generally end up hundreds or thousands of times farther from their new stars than Earth is from the sun. 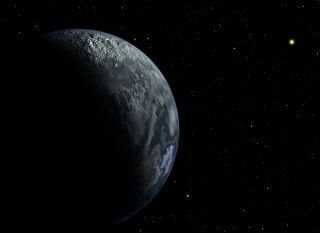 They're also likely to have orbits that are tilted relative to any "native" planets, and they may even revolve around their stars "backward," researchers said. Astronomers have yet to detect any clear-cut cases of captured rogues. Imposters can be difficult to rule out, since gravitational interactions within a solar system can throw native planets into wide, tilted orbits that mimic the signature of a captured world, researchers said. Perhaps the best evidence to date in support of planetary capture comes from the 2006 discovery of two huge planets — 14 and 7 times more massive than Jupiter — orbiting each other without a star. "The rogue double-planet system is the closest thing we have to a 'smoking gun' right now," Perets said. "To get more proof, we'll have to build up statistics by studying a lot of planetary systems." Finding a planet in a far-flung orbit around a low-mass star would be a good sign of capture, researchers said, because the star's disk wouldn't have had enough material to form the planet so far out. Is it possible that our own solar system grabbed a wandering planet? Astronomers have peered at the outer reaches beyond the dwarf planet Pluto, and they haven't found anything yet. "There's no evidence that the sun captured a planet," Perets said. "We can rule out large planets. But there's a non-zero chance that a small world might lurk on the fringes of our solar system." The study will appear in the April 20 issue of The Astrophysical Journal.